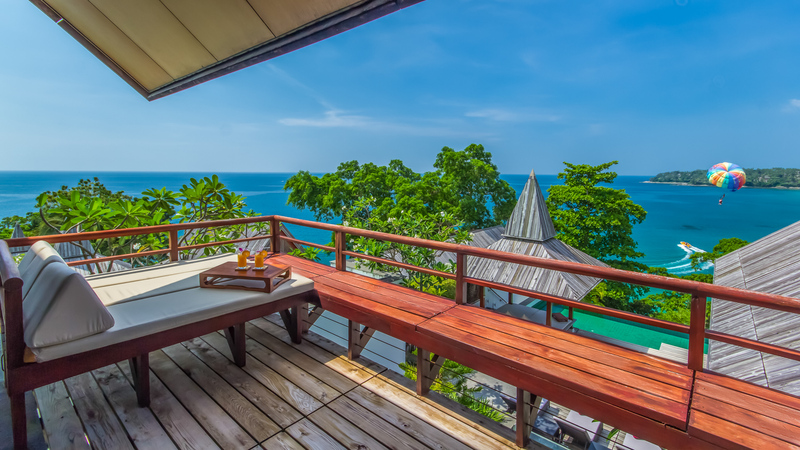 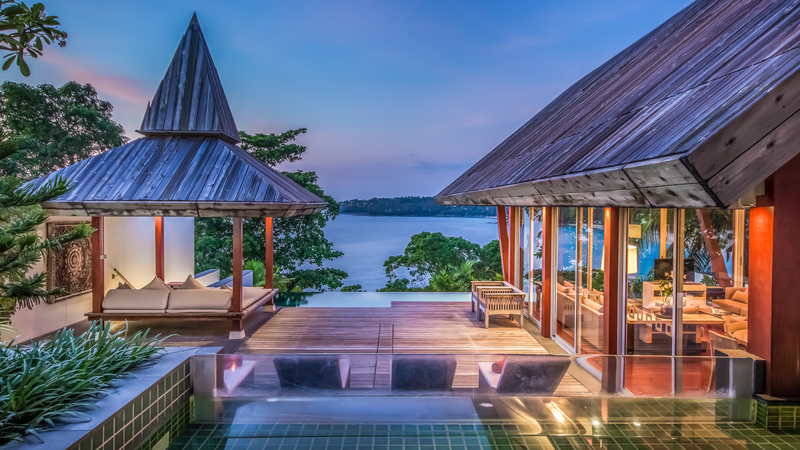 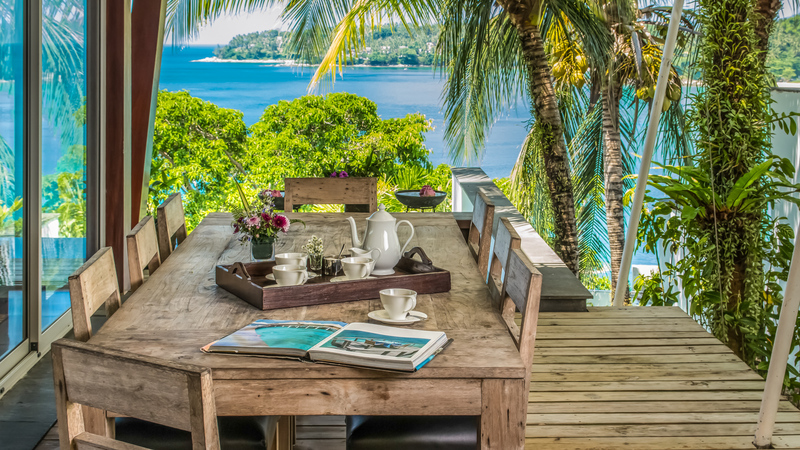 Laemsingh Villa 3 is a stunning waterfront property with views out to Surin Beach. 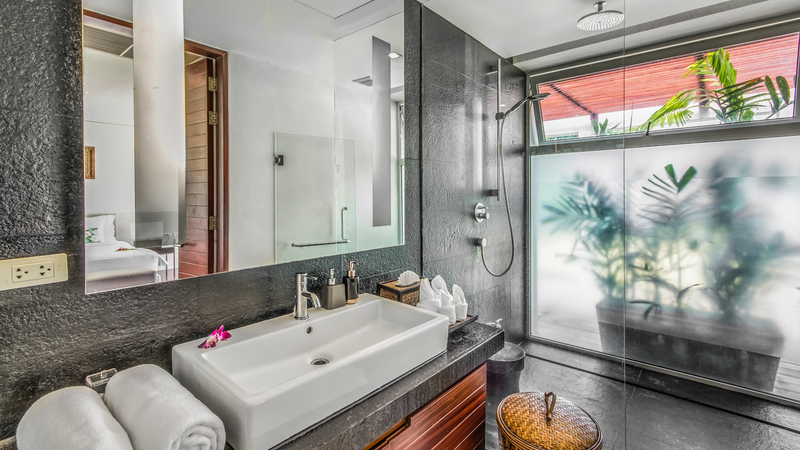 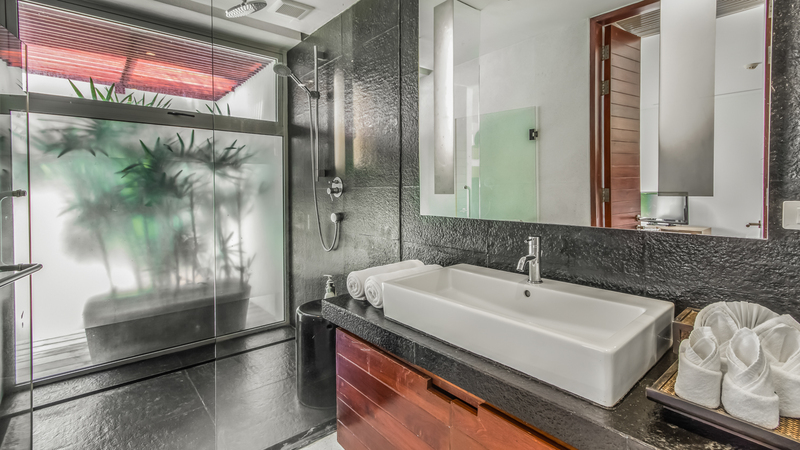 It was designed by Ernesto Bedmar and features beautiful natural materials that harmonize with the lush coastline and timeless sea, while high-end appliances and amenities provide an exquisite luxury experience. 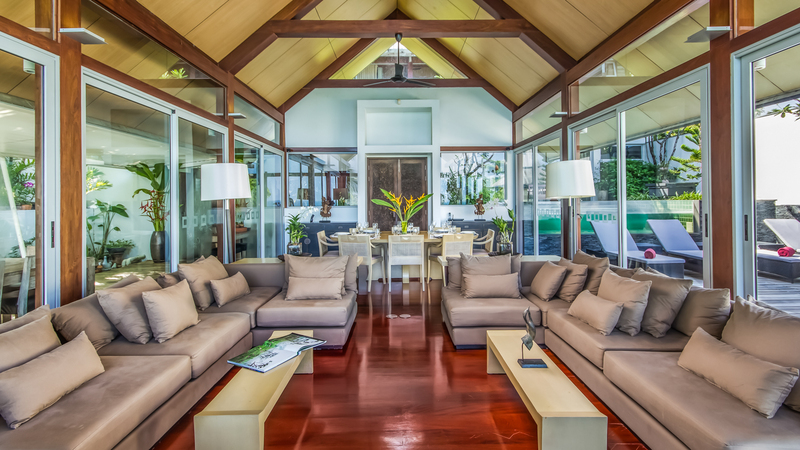 This architecturally designed residence is set in a gated community with 24 hour security and offers a private sanctuary for up to 10 guests perfect for families, groups or couples, with full time friendly staff ready to take care of all your needs. 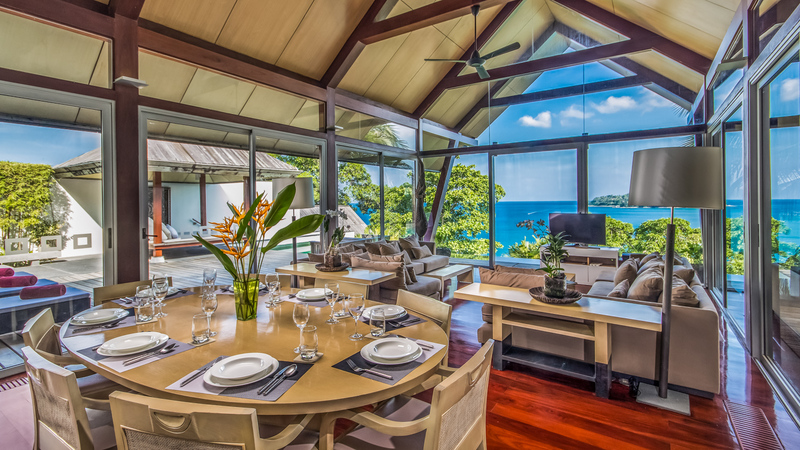 The light-filled interior offers modern, plush seating where you can lounge in style while enjoying breathtaking ocean views from the expansive ceiling to floor windows. 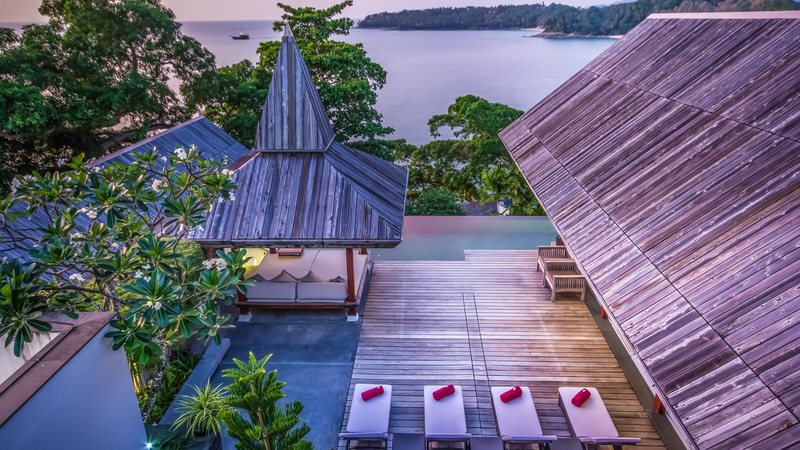 There is indoor and outdoor dining available and the outer deck area opens to the delightful pool and stunning views of the Andaman sea. 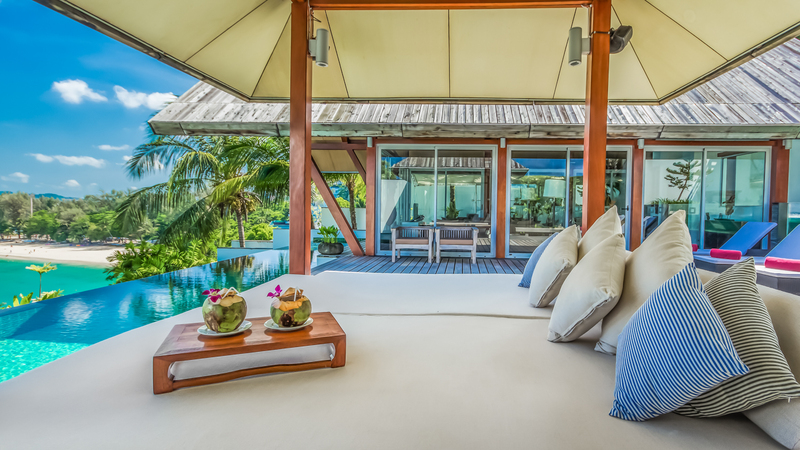 Opening out onto the timber deck the sun loungers and daybeds accompany the infinity edge pool and provide a perfect place to swim, rest and sunbathe while enjoying the beautiful sea vista beyond. 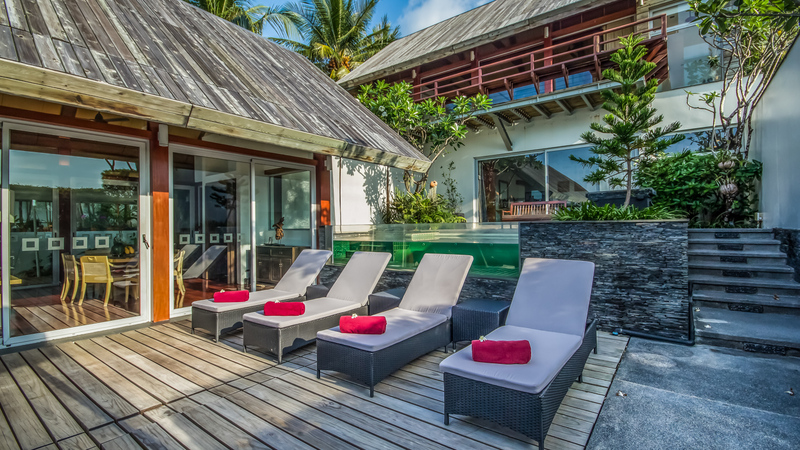 Outside there is also another smaller glass-fronted pool with built-in jacuzzi jets, perfect for small children or adults wanting to relax whit a drink. 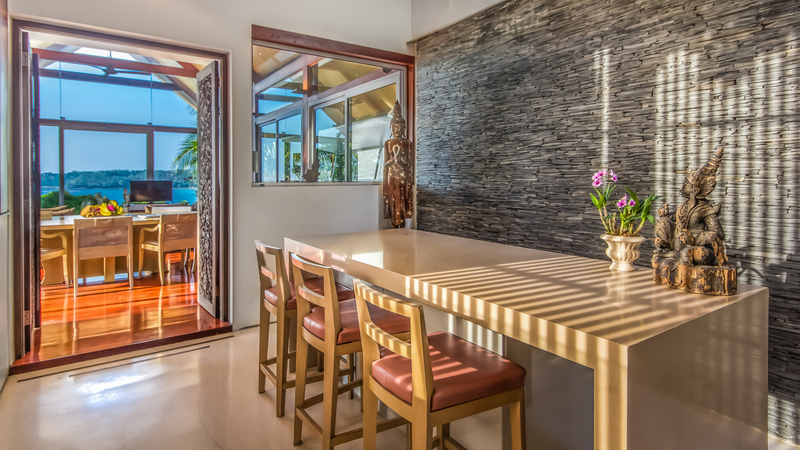 Indoor and outdoor dining is provided as well as a handy day bar and the large kitchen comes with all modern amenities. 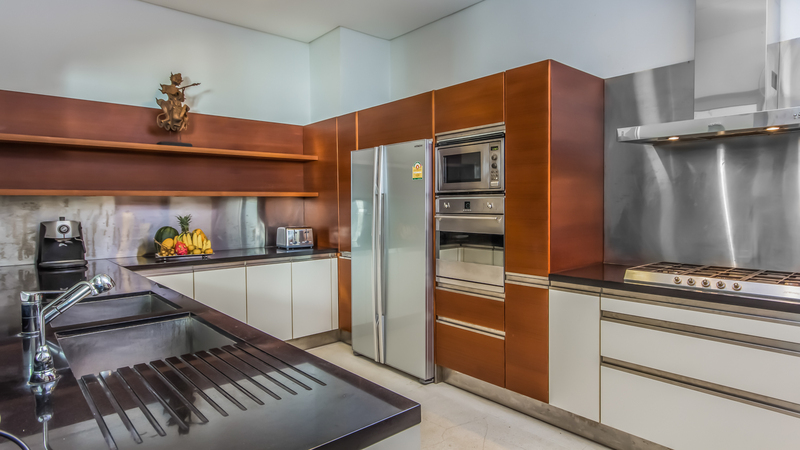 The staff kitchen and living quarters are in a separate area of the villa. 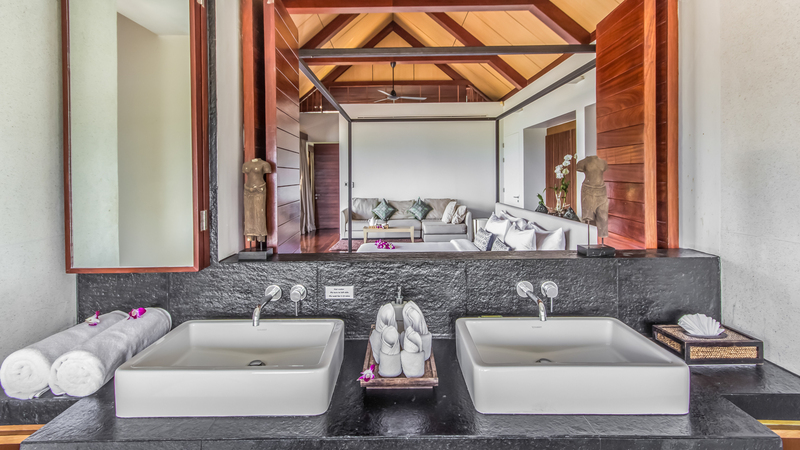 The villa has 4 elegant bedrooms each with their own ensuites. 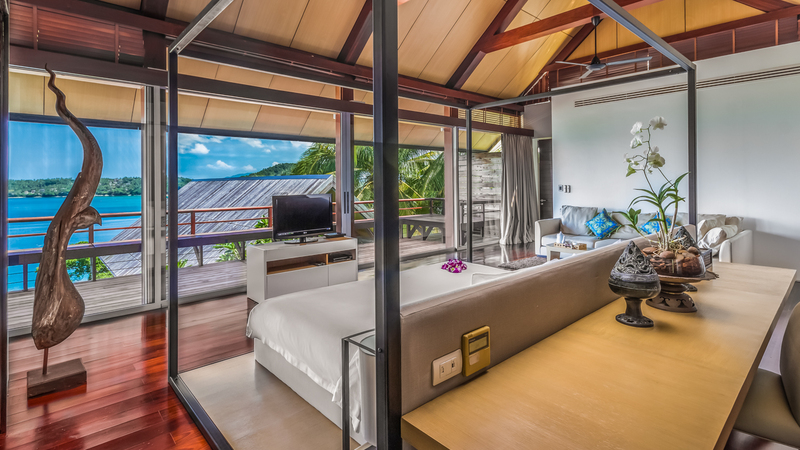 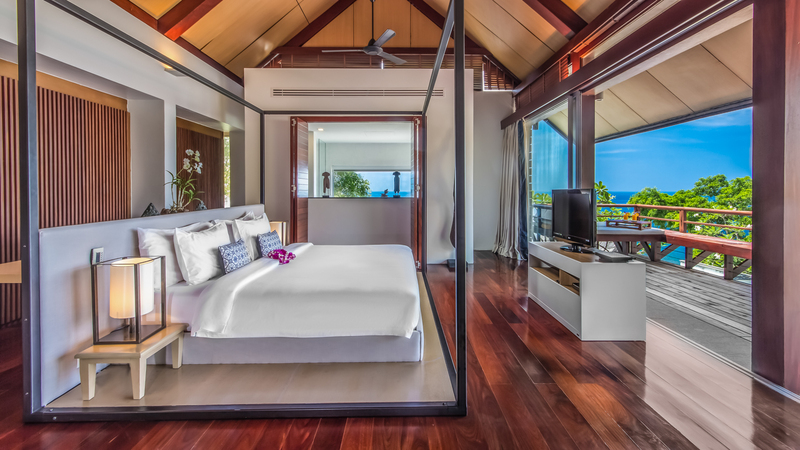 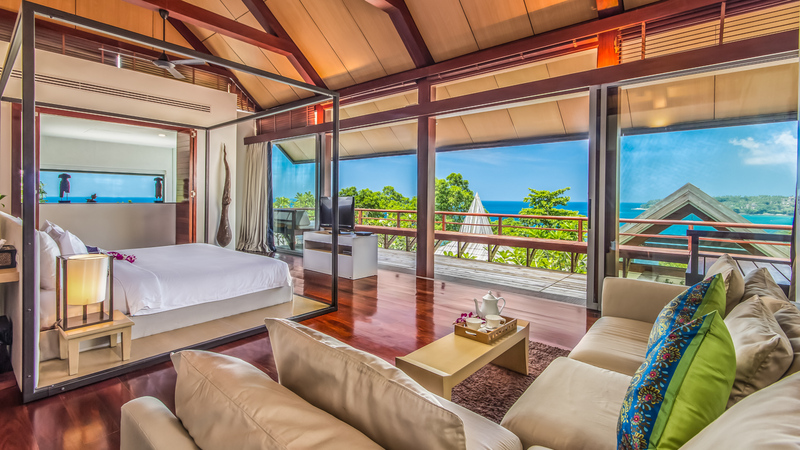 On the upper level is the spacious master bedroom which comes complete with a luxury ensuite, office area and a small lounge opening onto a private balcony with outdoor daybeds and panoramic ocean views. 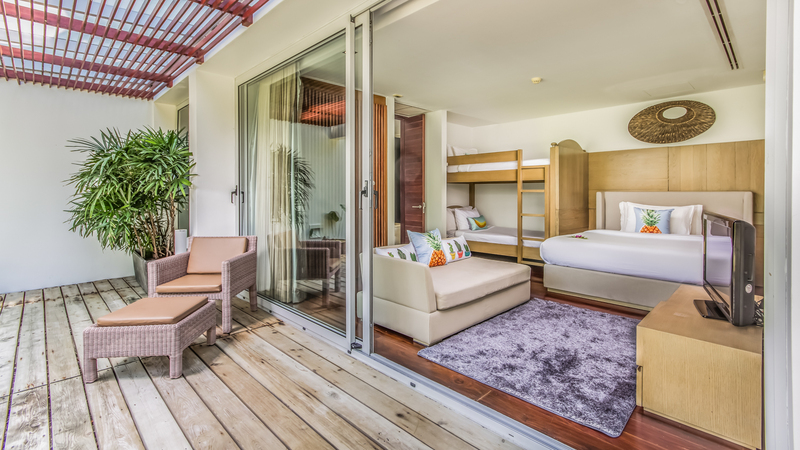 The bedroom on the main level also opens to a deck and the bed can be configured to become two while a fold-out lounger can also be converted to an extra bed if required. 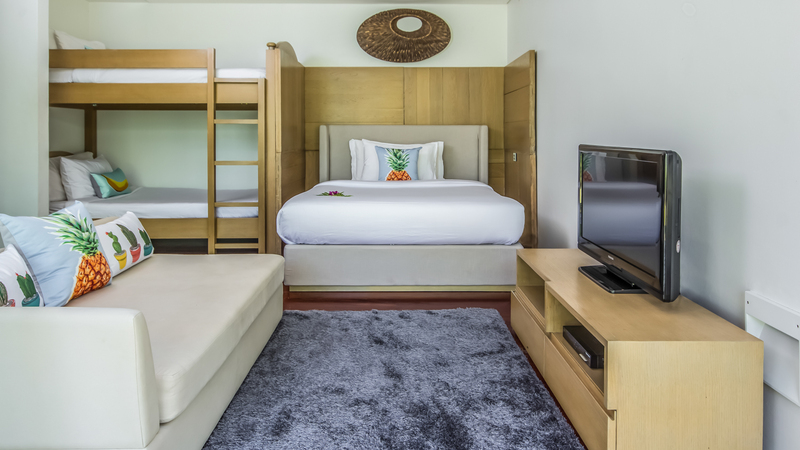 There are 2 more bedrooms situated on the lower level including a children’s bunk room with an extra bed. 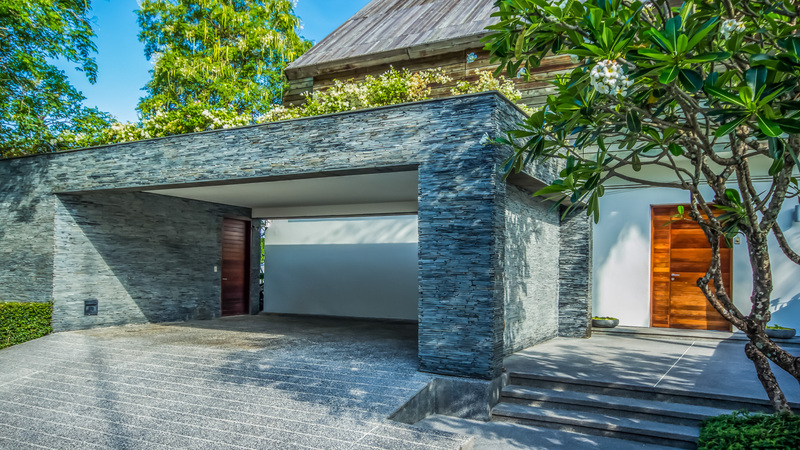 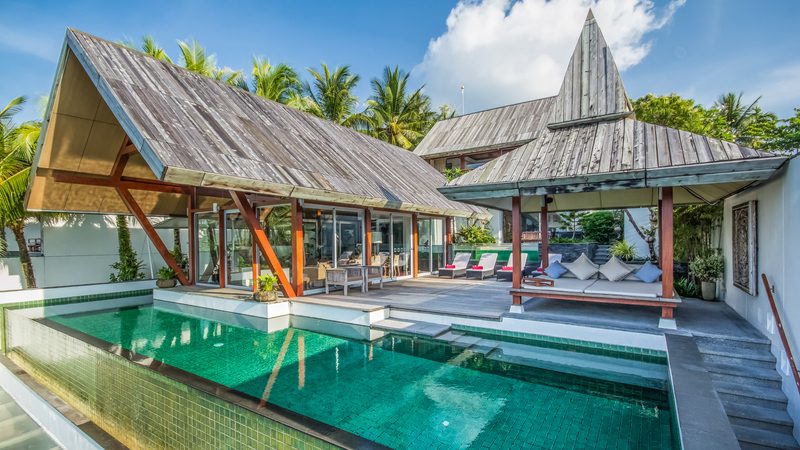 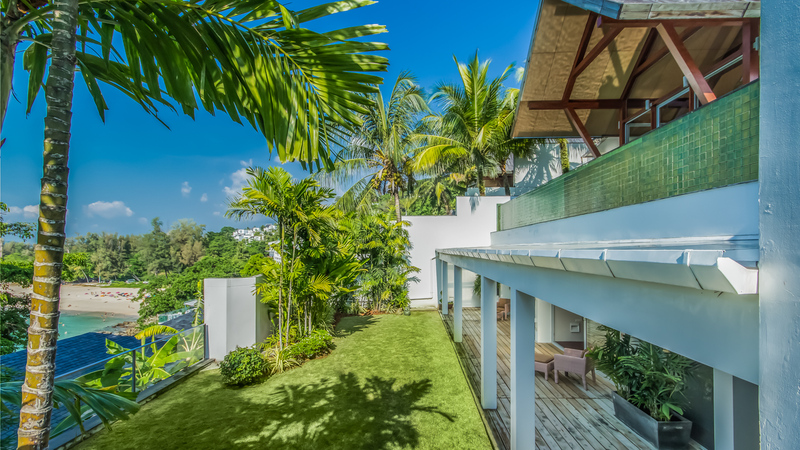 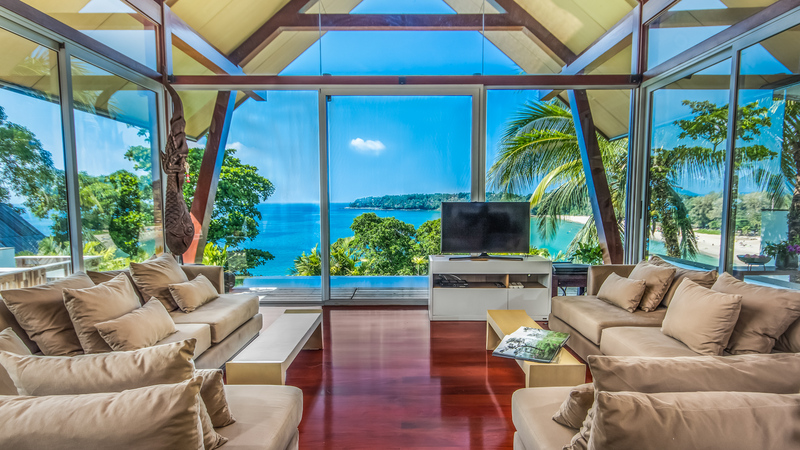 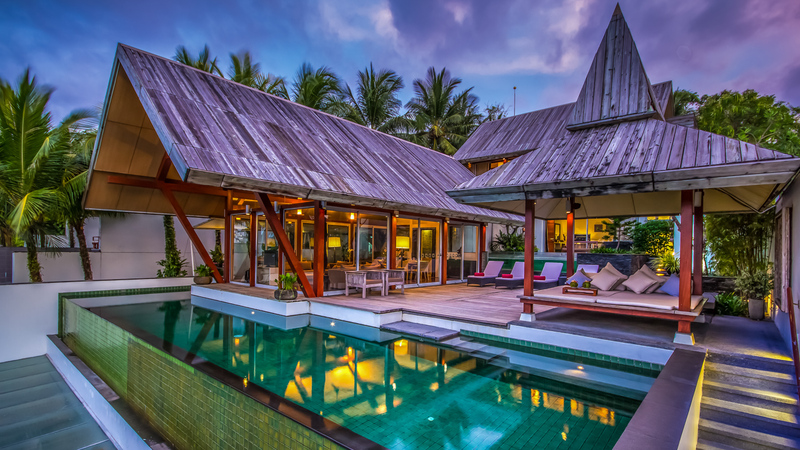 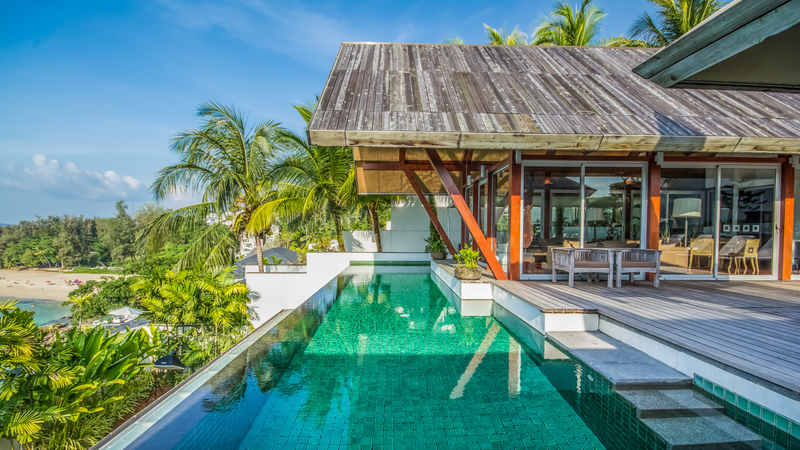 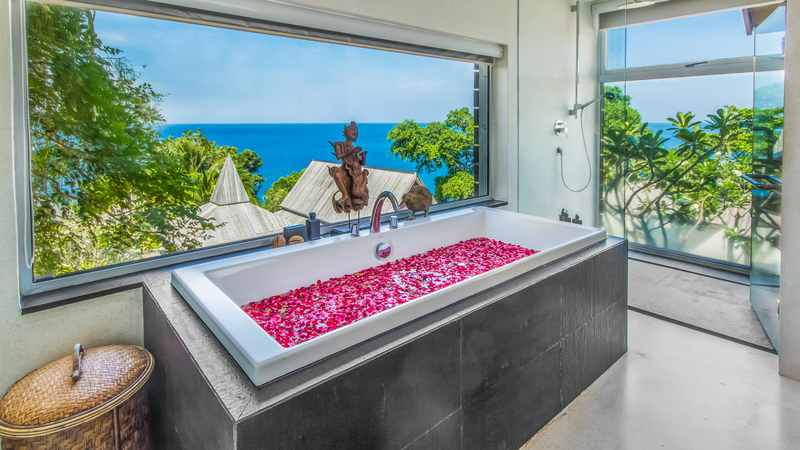 This villa is located close to Surin Beach in West Phuket. 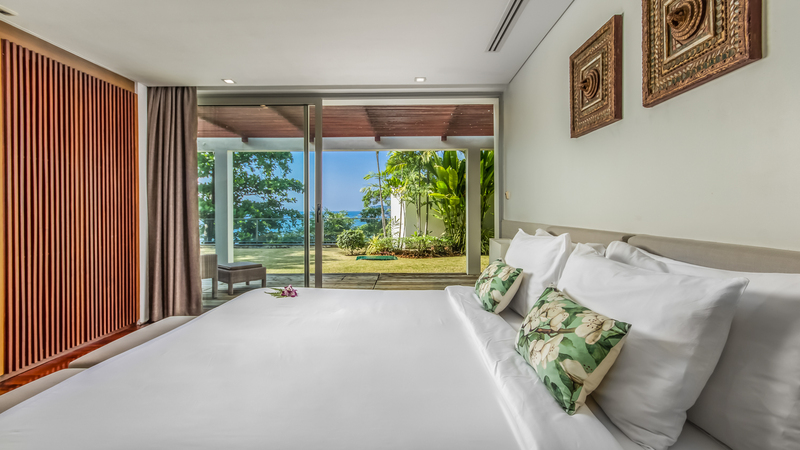 The pristine white sand shores of Surin, along with its seafront high-end vacation rentals makes the area an attractive destination for luxury travellers. 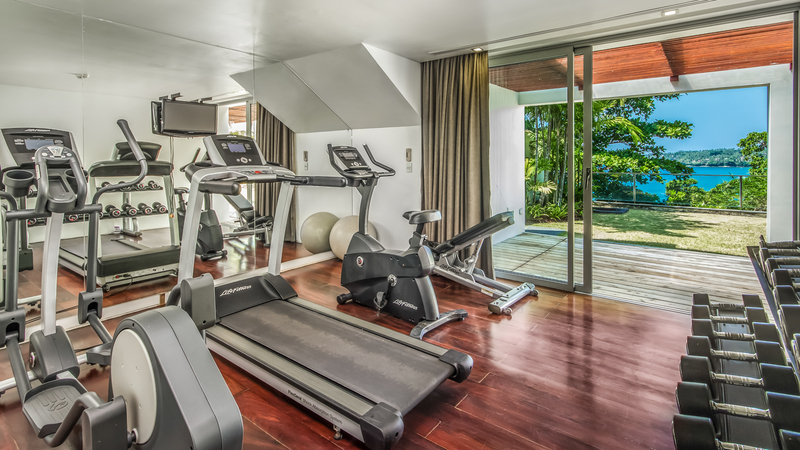 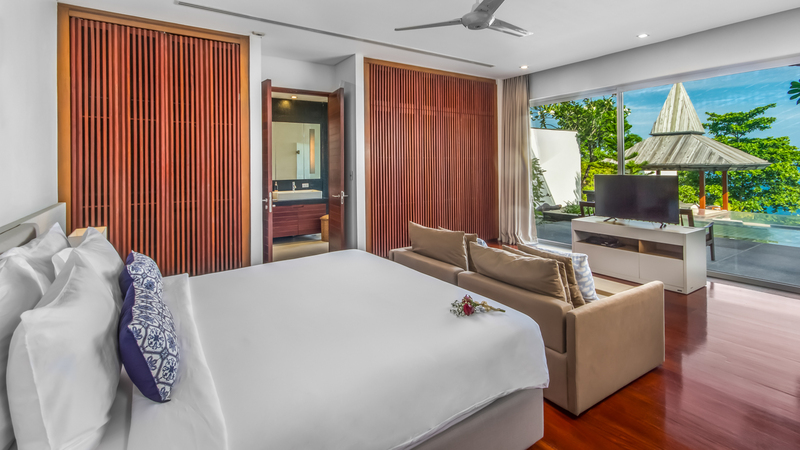 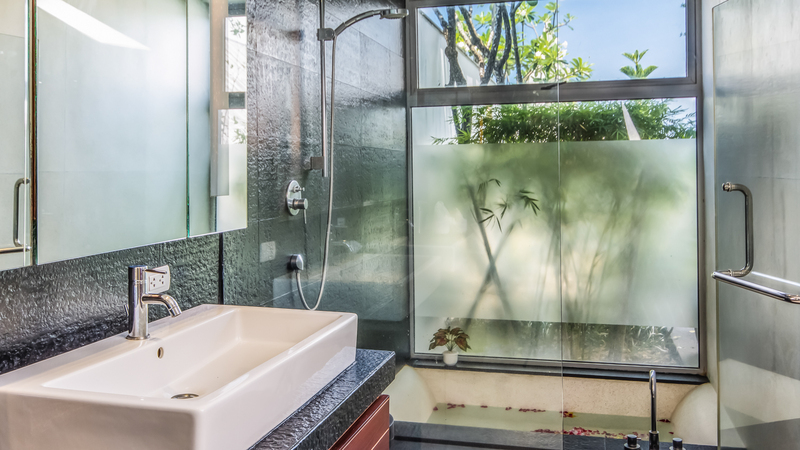 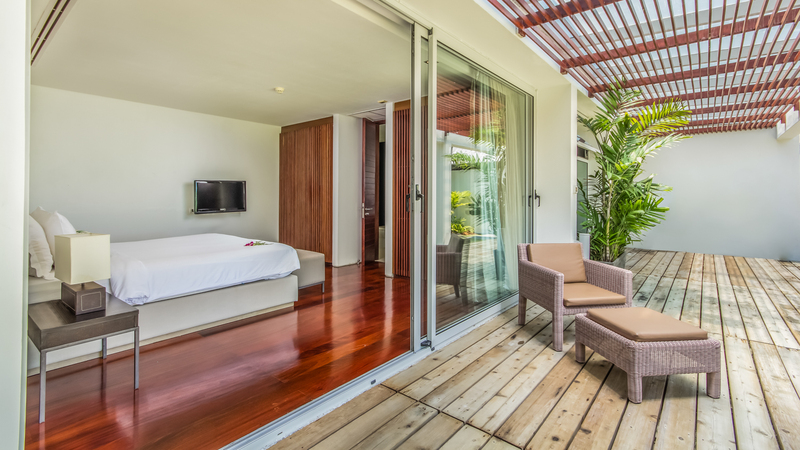 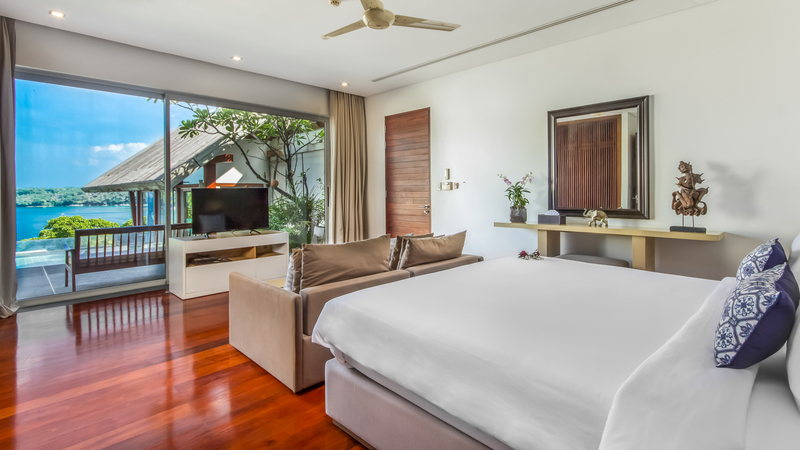 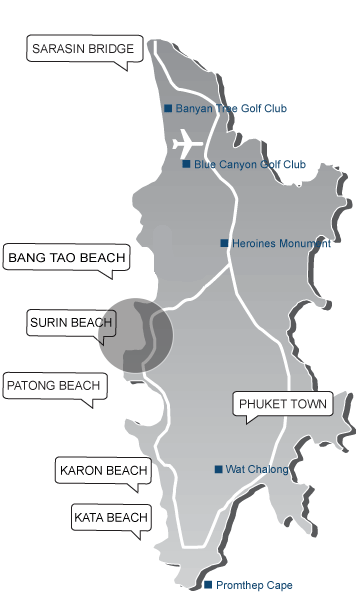 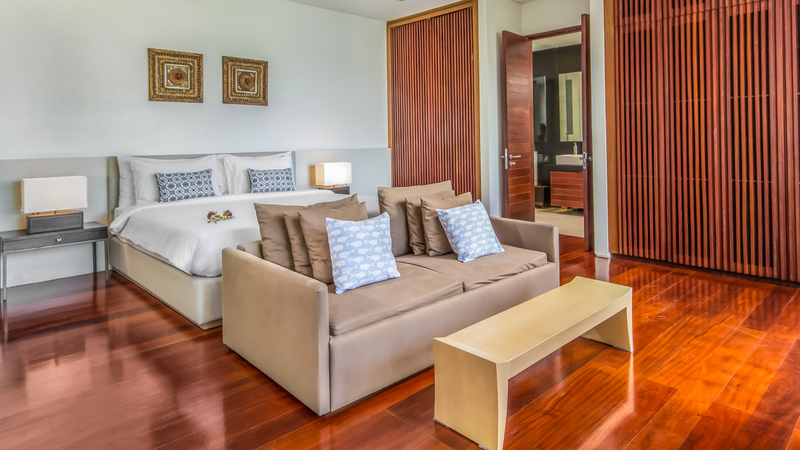 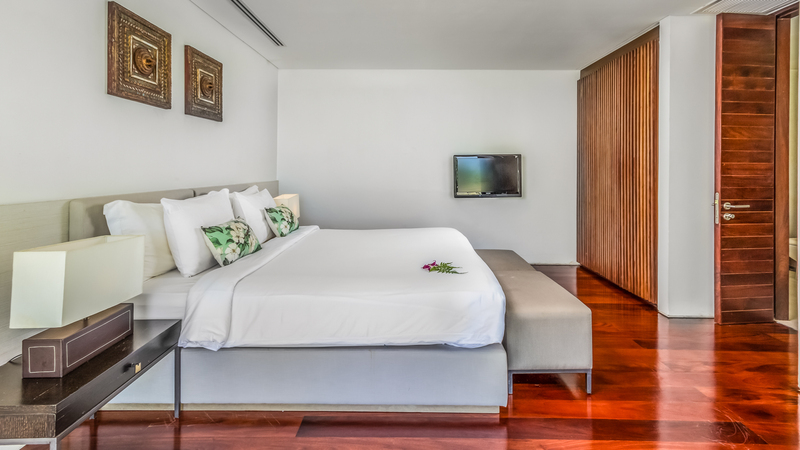 You’re about 15 minutes’ walk or a three-minute drive from Laem Singh Beach and Surin Beach. 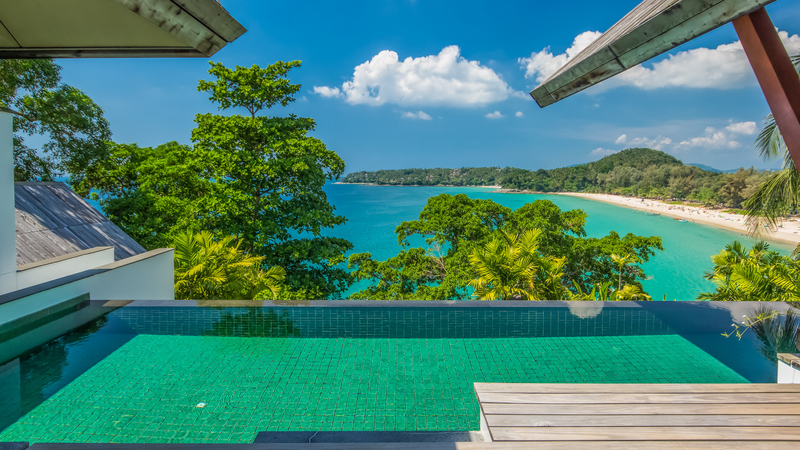 The latter offers excellent swimming conditions from November till April.